When a person wants to show elegance, pairing a watch with an outfit might be one option. Rolex is the watch standard for elegance. But which type of Rolex should you go with? 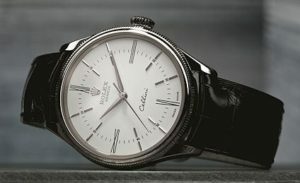 While Rolex’s sportier models might get more attention and prestige, the Cellini line is Rolex’s jump into the dress watch line with a thinner and more streamlined approach. The line is named after Benvenuto Cellini, a 16th century Italian goldsmith and writer whose name first graced the precious metal series in 1928. The watches themselves are simple, yet elegant. The cases are made of 18-karat white or Everose gold and only size out at about 39 millimeters. The Cellini Time models are made with a classical thought in mind, using Roman numerals and stretched applique hour markers divided by a minute track that has been moved toward the center of the dial, closer to the tips of the hands. With precision, sword-shaped hands count off the seconds, while Rolex’s iconic name and crown logo are prominently placed at 12 o’clock. “Cellini,” written in cursive script, is opposite that at six o’clock. 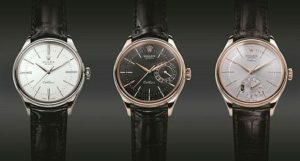 The Cellini Time models are offered in four versions, letting buyers choose between a white or black dial and between the white or Everose gold casing. For the band, stitched alligator leather in black or brown complete the watch. 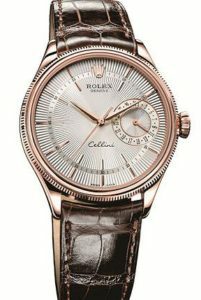 A Rolex Cellini Time model can go for around $15,000 or more. I like the looks of this one better than the other Rolex’s, especially the black faced one. Thanks Mark. Another great insight…..and a beautiful timepiece. I really like the variations ROLEX has created. Thanks, I would know about the other time pieces but for your thoughtful emails. there are a number of Cellini watches for sale for around $2,000. It must be a simpler or more common model. Is it worth it to buy one in the 2,000 price range? My dream watch list is a Blancpain 50 Fathom, Zenith El Premiro, Cartier Tank, and a gold Cellini dress watch with a black face. – thanks for posting. Wallstreet or Bank exec watch, no frills. Very conservative statement. 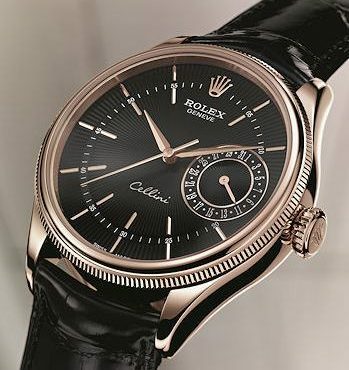 얼마전 Rolex Cellini 분해 소제 했습니다. 수동시계라고 $120 (우송비 포함) 인데 카드로 안하고 체크로 하니 5불 깎아주더군요. 공장입고는 가격 때문에 좀 부담스러웠는데 이곳에서 훨씬 싸게 할 수 있었네요. 한 2주 정도 기다리면 잘 돌아가는 시계를 다시 만날 수 있습니다. I just had my Cellini overhauled. Thanks for the excellent job and price as well.